This article is a short summary of Mario Kart DS. 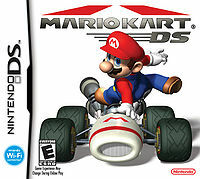 Mario Kart DS is the fifth main installment in the Mario Kart series, released in 2005 for the Nintendo DS. It is the first game in the series to use the Nintendo Wi-Fi Connection. Mario Kart DS is the third best selling game for the Nintendo DS, selling 23.56 million copies worldwide. "The ultimate Mario Kart race is on! Total shell-tossing mayhem! Frantic speed, crazy new items, multiple karts per character, and an all-new mission mode make this a Mario Kart fan's dream! Over 30 courses! Tour brand-new tracks and battle arenas, as well as favorite courses from every Mario Kart game in the series! Race your friends over the Internet with up to 4 karts at once or have 8-player free-for-alls with one Game Card using local wireless!" "Frantic speed and item-tossing mayhem await on these racetracks! This classic game is part of the Virtual Console service, which brings you great games created for consoles such as NES™, Super NES™ and Game Boy™ Advance. We hope you'll enjoy the new features (including off-TV play) that have been added to this title. See more Virtual Console games for Wii U." Basic gameplay is retained from the previous games in the series, in that racers race on various tracks while using items to assist them in placing first. The game features eight cups with four tracks each. Single-player modes consist of a mode where the player races computer-controlled opponents, a mode where the player battles computer-controlled opponents, a mode where the player attempts to make the best time in which a ghost of their results can be saved, and a mode where the player takes on various missions with differing criteria for completion. For multi-player modes, players can race or battle locally with up to eight players using Download Play or Multi-Card Play, or race online with up to four players using the Nintendo Wi-Fi Connection. The aforementioned battle mode is split into two modes: Balloon Battle, where competitors use items in an attempt to pop the most of their opponents' balloons, and Shine Runners, where competitors try to collect the most shines, using items to steal shines from their rivals. JPN:2016 A direct port of the game released as a digital download on the Wii U Nintendo eShop, with added Virtual Console emulator features. This page was last edited on 3 November 2018, at 22:48.